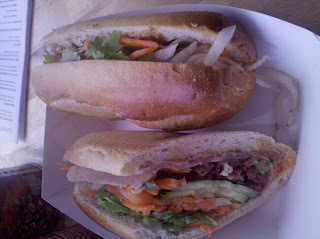 One of my favorite sandwiches ever...the Vietnamese banh mi! The Vietnamese banh mi standard is thinly sliced pickled carrots and daikon, cilantro, cucumber slices, jalapeños, pate, mayo, and a meat filling - my favorite is roast pork all served on a warm crusty baguette. The sandwich shown to the left is Baoguette Cafe's signature sandwich - Baoguette. At only $5.75 a sandwich (you really can't beat that in NYC) you get Baoguette's own house made pork pate, house-made terrine, thin slices of pork belly, stuffed with the standard pickled carrots & daikon, cucumber, cilantro, mayo, thai jalepenos, mayo, and sririacha. For all you picky eaters who scrunch up their nose at the thought of pate (which is liver btw) , you should not judge something you have not tried. I will use my wonderful coworker Rondel for example who knows he dislikes pate but really REALLY loved this sandwich. The great thing about a banh mi is that it is a hearty sandwich because of the juicy fatty meats stuffed in there but than is counter balanced with the refreshing taste of the raw veggies. Third and last on my list is Nicky's Vietnamese. Nicky's is more focused on the pate for me and doesn't put enough roast pork in his. Frankly, if I am craving a really good Vietnamese sandwich, this doesn't do the trick at all. I would eat it and my tummy would simply respond back, "Thanks for that but when are you feeding me the real thing?" First place -- Saigon bakery in Chinatown. The most delicious roast pork sandwich served out of the back kitchen of a jewelry shop! You can get delicious sandwiches with a side of jade bracelets. Stay tuned, savorylinings will do a blog of this shortly in the future!